India is very well known for it’s rich architectural and cultural heritage with its unique style. In the field of movie and production, India is well known for its variety and ideal scripts. There are various forms of award function organized in India which is performed at different levels. One of the main award functions is RFF which is organized in Rajasthan and is one of the Best Award Function in India. The arts, dance forms, music styles, songs have maintained the culture of Rajasthan since ages. This award function was organized and started by Kanchan Cassettes & Series they took an initiative and thus organized Rajasthan Film Festival on 28th September 2013. This Award Function in India was aimed to create an adverse impact on the cinema of Rajasthan and to promote regional art and culture. Rajasthan Film Festival involves events, award show to honor and encourage the artistic and technical talents of artists in Rajasthani cinema. Because of this award function, the hidden talent is appreciated and comes up with identification.it is one of the best film festivals in India. There are many performances, plays, live performances by singers, stand up comedians and poets which entertain people. Rajasthan Film Festival is organized at different locations and celebrities from all over India come to attend this event. Different rewards are given to the people for showing extraordinary skills in the respective fields. 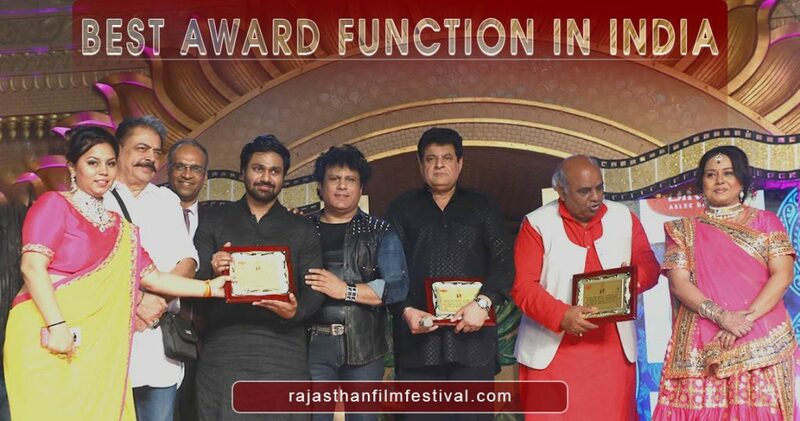 Because of this award function, Rajasthani filmmakers and artists also feel proud and pleased for the work they have done in the field of filmmaking they are awarded by very well known and renowned people of Film Industry.